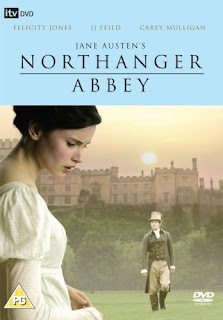 I just recently watched 'Northanger Abbey.' I happened to receive the Masterpiece Theater version of the film (which was released in 2007) from Netflix. Netflix is so very wonderful for having all of these period piece dvd's! It was such a lovely sweet film. I suggest, if you haven't done so already...watching this movie. Other than a few immodest bodices it is very much so scatheless. Catherine Moreland, the story's heroine, and I have quite a lot in common. We are dreamers who love to read, spend time with our family...and going for long walks...especially when in the company of our dearly beloved. Henry...well he is just rather dashing isn't he? Please watch it...curl up with a knitting project in hand, a quilt to hand sew, a sister to laugh and cry with or even better yet watch with your momma and breathe it all in at once together basking in all the propriety, dresses, speech and dancing. I will warn you: prepare to be charmed entirely! Now I am off to watch a very similar movie...at least in it's literary styling and theme, 'North & South' which a friend of mine, Jennifer C., has so kindly lent me to borrow and watch...off I go to watch...good night my blog readers! Great movie, although I think I watched a different production other than the one you have pictured. It was good nonetheless. I also watched North and South as well as Wives and Daughters... lovely pieces of work! !